Niehaus is dancing ‘like a cat on a hot tin roof’, said one, while another added it was as if his ‘start button’ was pressed too late. A video of former ANC spokesperson Carl Niehaus and Minister of Cooperative Governance David van Rooyen dancing ahead of President Jacob Zuma’s OR Tambo memorial lecture in Kagiso, near Krugersdorp, on Sunday, has emerged. 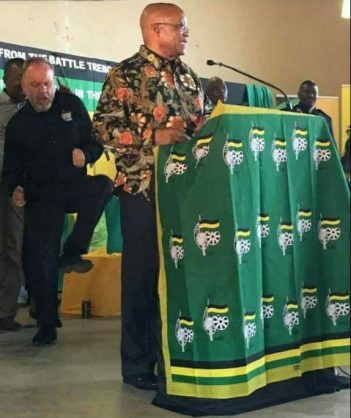 In the video that has been circulating on social media, Niehaus and Van Rooyen can be seen dancing to a toyi-toyi song, along with other ANC members on stage, as the president sings. According to journalist Asanda Magaqa who shared the video, the video was a depiction of “dancing for your supper”, as some questioned if, as a member of the MKMVA, Niehaus could not toyi-toyi. On behalf of all other Carls out there, we disown this guy…. Can someone be kind and tell Carl to SIT DOWN!!!! Carl Niehaus is a Vet(eteren) by can't Toi-toi???? It just looks so sad when you can't even dance ??? ?